Autoimmune diseases, such as lupus, rheumatoid arthritis and MS, affect more than 250 million people worldwide. In the United States, they are the 3rd leading chronic disease behind cardiovascular disease and cancer. Are you a healthcare provider who wants to better treat your autoimmune patients? If that sounds like you, or you just want to learn more about treating and reversing these conditions, than this article is for you! You will learn what I believe are the 7 major factors causing autoimmunity so you can understand why we have such an epidemic of chronic inflammation and autoimmunity. Every one of these is a piece of the pie–for some, one piece may be bigger–but all play a role to some degree. As a clinician, I focus in on addressing all 7 of these areas to help people overcome their auto-immune challenges. Here is the rationale and some research support for each area. Gluten is the common protein found in wheat, barley, kamut, spelt & rye. Gluten is a sticky, storage protein that is challenges the digestive tract. Gluten often binds to the small intestinal wall where it can cause digestive and immune system disorders. Full-blown gluten allergies create destruction of the small intestinal villi (pockets that allow for nutrient absorption). This condition is called Celiac disease but is not officially diagnosed until there is severe enough damage to the intestinal tissue to qualify for the diagnostic criteria of Celiac. Non-Celiac Gluten Sensitivity (NCGS) is an epidemic that is a major contributing factor with inflammatory and autoimmune diseases. For these individuals consuming gluten creates a chronic stress response that hyper inflames different regions of the body. NCGS is highly associated with inflammatory disorders of all kinds (2). It is also a contributing factor in many autoimmune diseases such as celiac disease, rheumatoid arthritis, type I diabetes, neurological disorders, Hashimoto’s thyroiditis, autoimmune cardiomyopathy, lymphoma, and dermatitis herpetiformis (skin disease) among others (3,4,5). It is also linked as a contributing factor in asthma, allergies, & eczema (6,7). In their position paper, the AAEM sites several animal studies that indicate extreme health risks associated with GM foods. Some of the health risks include infertility, immune dysfunction, allergic reactions, accelerated aging, insulin dysregulation, organ malfunction and digestive dysfunction (8). The gut plays a role in over 80% of the immune system and has a direct connection with the brain through the vagus nerve. Poor bacterial balance or dysbiosis is associated with every digestive tract disorder as well as auto-immuneconditions and psychological and behavioral issues. The health of the body and mind are especially dependent upon the health of the human microbiome. When the digestive system is damaged it leads to improper nutrient absorption and an increase in toxic substances in the body (9). This is one of the leading causes of chronic disease. For example, excessive yeast produces toxic substances that can pass through the blood-brain barrier and alter neurological functioning causing “brain fog,” behavior problems and learning difficulties. Birth trauma, bad posture over time and other traumas such as car accidents and falls affect and stress the spine. In particular, these things can damage the vulnerable upper cervical spine which is extremely stressful to the body. The ramifications of increased stress hormones in the body include overworked adrenal glands, lowered immunity, decreased digestive functions, fatigue, & blood pressure disturbances. Subluxation is the term for misalignments of the spine that cause compression and irritation of nerve pathways affecting organ systems of the body. Subluxations are an example of physical nerve stress that affects neuronal control. According to researchers, neurological stress leads to altered measures of immune function & increased susceptibility to a variety of diseases (13, 14). The modern world is full of environmental toxins. It is estimated that there are over 80,000 toxic chemicals used regularly in the US. There are over 500 chemicals stored in our body and the average individual has at least seven pesticides tested in their urine (15). It is imperative to have a daily detoxification lifestyle to get these unwanted toxins out of our system. The body has a built-in metabolic detoxification system to address this problem by converting fat soluble toxins into inactive water soluble metabolites. This process is carried out by a series of enzymes that transform, conjugate (attach) and transport the toxins out of the body. Many individuals have genetic polymorphisms that hamper their ability to detoxify. Others have had their detoxification systems overwhelmed resulting in low glutathione and methylating elements. Without these key factors, these individuals are unable to adapt and detoxify which allows oxidative stress and inflammation to be amplified. Chronic, low-grade stress is a modern day epidemic that creates sluggish metabolism, chronic inflammation and abnormal immunity. This stress depletes the body of critical nutrients and causes oxidation of various cellular elements. Elevated stress hormone levels can create digestive problems and leaky gut syndrome, increased appetite, weight gain, thyroid disorders and accelerated brain degeneration (16). These are common findings in the brains of those with anxiety disorders, depression and other psychological disorders. Many auto-immune conditions have chronically elevated stress hormone production as a catalyst for this abnormal immune response (17). Living in a state of fear is extremely destructive to human physiology. Fear drives stress hormones which utilize all the key resources in the body and leave the system drained after a period of time. Chronic parasitic infections are linked with intestinal permeability and leaky gutsyndrome, irritable bowel syndrome, irregular bowel movements, malabsorption, gastritis, acid reflux, skin disorders, joint pain, seasonal and food allergies and decreased immunity (18, 19, 20). Other major infections include Herpes, Lyme disease, Human Papilloma Virus and Cytomegalovirus, H Pylori, Small Intestinal Bacterial Overgrowth (SIBO) and Candida. There are many others but all of these drain the immune system and cause abnormal reactions that can result in auto-immunity. 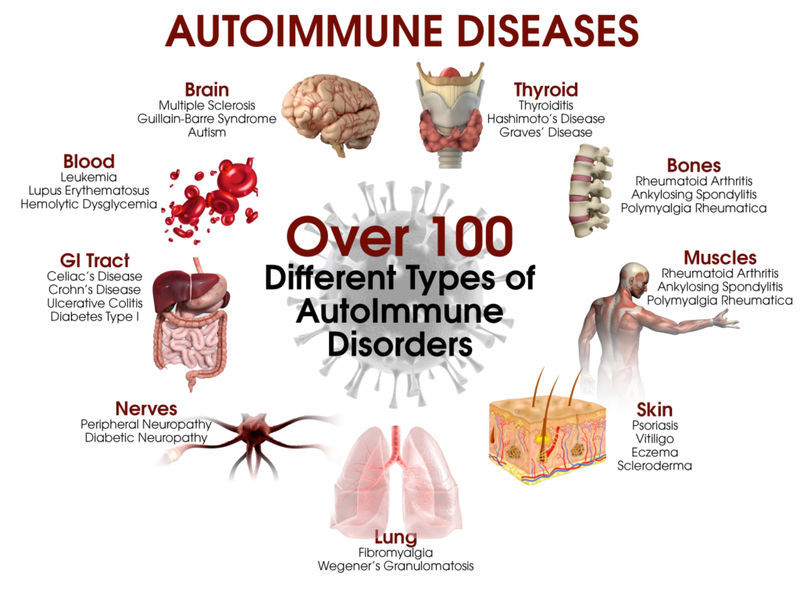 I developed the AutoImmune Elimination program after years of research and clinical experience working with thousands of clients with autoimmune and chronic inflammatory disorders. This program goes over the key foundational strategies to address the major causes of chronic inflammation and leaky gut. My hope and prayer is that this program provides you with the knowledge and tools to improve your life and heal naturally. Be sure to check out the webinar I released where I did a specific training on the components of this program and how to put these things into action. 36 of the world’s top experts in integrative medicine and science are here to discuss the strengthening of your immune system to help protect you from all types of diseases, including autoimmune disorders, cancer, heart disease, dementia’s and even common pathogens like the flu, measles and pneumonia. 8. Vighi G, Marcucci F, Sensi L, Di Cara G, Frati F. Allergy and the gastrointestinal system. Clinical and Experimental Immunology. 2008;153:3-6. 9. Vighi G, Marcucci F, Sensi L, Di Cara G, Frati F. Allergy and the gastrointestinal system. Clinical and Experimental Immunology. 2008;153:3-6. 16. Turner J, Kelly B. Emotional dimensions of chronic disease. Western Journal of Medicine. 2000;172(2):124-128.